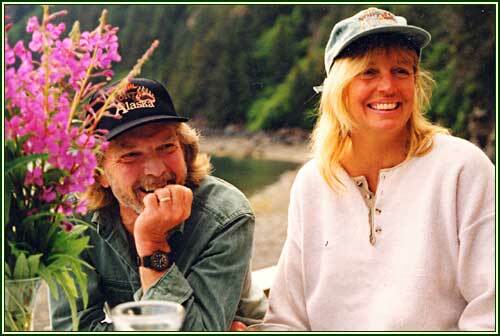 A modern-day Alaskan pioneer, Keith purchased his land in Sadie Cove in 1973 and proceeded to build. He began in the Scandinavian tradition with the sauna where he spent his first winter planning and sketching what would ultimately become Sadie Cove Wilderness Lodge. Some of the humorous ways Keith found to finance this project can be read about in his autobiography, Alaska Viking. Of his life in Alaska, Keith says "Early on I discovered that my successes as an architectural consultant and the freedom of driving my Porsches were not what I wanted from life. I came to Alaska on a whim and found exactly what I was looking for and have never left." An intrepid adventurer, Keith has climbed, walked, snowshoed, skied, hunted, and fished thousands of miles around this area in his 40 years of residency. He has many a salty sea story to tell of his travels around Kachemak Bay in all manner of watercraft from kayaks to open skiffs to commercial fishing boats in our beautiful but sometimes feisty weather. Born and raised in New York City, Randi left behind the glitz and glamour of modeling and photography in the late '70s when she moved to Hawaii and then on to Alaska. Of her home in Alaska Randi says "I'm so happy to have found this rugged place. My heart and spirit were meant for the far north." Making her living for many years in remote bush Alaska cooking, cleaning and caretaking for fly-in resorts, Randi later purchased a house in Homer where she met her husband-to-be Keith in 1995. Together with Keith, the birth of the Internet, and a lot of joy, she helped to run the lodge and bring it to the place where it is now - considered to be one of the top 10 Eco-Resorts in North America. Keith and Randi Iverson, loyal stewards of this land for decades, have been exceptional hosts for thousands of guests for 28 years. Beginning in 1972, the lodge was created by hand with local materials often discovered on the surrounding beaches. Using all of the courage, ingenuity and creativity that brought him to Sadie Cove in the first place, Keith hand milled driftwood into boards to become cozy cabins, an old barn on the Homer side of the bay was dismantled to build a 2 story cabin on the wharf, drift logs were used as pilings for the expansive wharf, and by trading his signature smoked salmon and other items for much of the remainder of his building materials, Keith managed to create a piece of functional art on his new slice of paradise. Through all the years the lodge has expanded and been improved but has always retained that spirit of originality which began when Keith was a child, not knowing then what that spirit would eventually lead to. Now boasting 5 cabins the lodge is as large as it will ever get so that it will remain a quiet and peaceful hideaway where guests can have the time and space to have personal adventures, good times and make new friends. Lodge patrons have the privilege of enjoying this soulful and historical property because of the Iverson's generosity and foresight to make it available to guests. Keith and Randi have a way of paying attention and taking care of others, of giving them a glimpse of a simpler and more peaceful time, and of living more easily and happily with less. People of integrity, they have positively influenced the lives of thousands with their warmhearted graciousness and generosity. Married in mid-life in 1997, Keith and Randi included in their wedding vows to care for their home and it's environment and especially to protect each other. They make that same promise to Sadie Cove, Kachemak Bay State Park, and to you, their guests. With the ingenuity, character, and graciousness of the Iversons they provide services of which they are proud. They strive to have a low impact on the environment by using non-polluting alternative energy systems, by recycling, and by "leaving no trace" when out on the trails. They support conservation organizations, and believe in using common sense when viewing wildlife. People like you visit Sadie Cove because they have a special dream and we help to make that dream come true by easing the anxieties, hassles, and perceived risks of adventure. Our mission is to cater to and provide an exceptional experience for every person who visits us. When we say "Thank you for sharing our adventure", we really mean it. Sadie Cove Wilderness Lodge serves as an example of what 2 folks in the wilderness can accomplish with a little imagination, a lot of persistence and the help of their friends. Is it really as nice a place as it looks? What do others say?